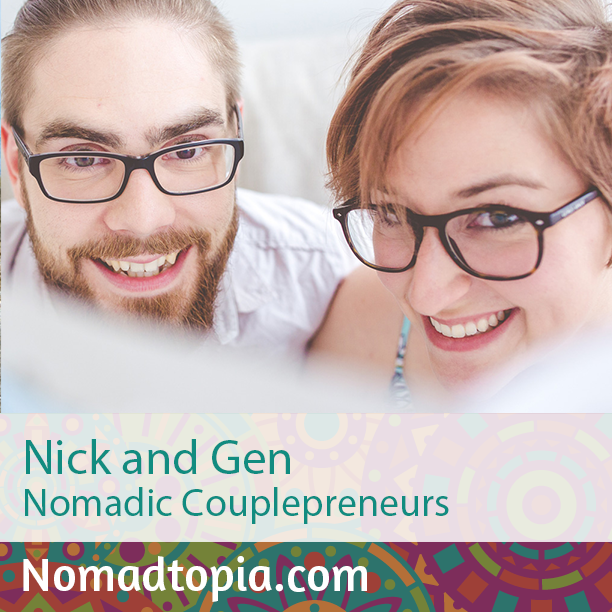 After starting a successful online business (and getting burned out and losing sight of their bigger goals along the way), Nick and Gen decided to try out a more nomadic lifestyle. They discovered that it allowed for more inspiration and creativity (and time off), so they sold everything and now run two full-time businesses together while traveling full-time. During our last trip to Thailand, we took a weekend to visit Chiang Rai, and had the incredible chance to have a friend of a friend who has been living there show us around. On a sunny Saturday, we rode scooters for the first time in our lives and the feeling was incredible. Especially the part where we rode on top of the Doi Chang mountain, with nothing but the valleys and steep rice fields on the horizon. This felt like true freedom. Traveling together and having to deal with a lot of frustrating situations—like thousands of ants invading our AirBnb in Lisbon—has made us very resilient and very patient. These days, we merely shrug when something like this happens, and don’t even waste our energy getting frustrated. It turns out that crappy situations like these turn you into a better human being.